A dazzling adventure story about a boy who rises from the ashes of slavery to become a free man of the world. George Washington Black, or "Wash," an eleven-year-old field slave on a Barbados sugar plantation, is terrified to be chosen by his master's brother as his manservant. To his surprise, the eccentric Christopher Wilde turns out to be a naturalist, explorer, inventor, and abolitionist. Soon Wash is initiated into a world where a flying machine can carry a man across the sky, where even a boy born in chains may embrace a life of dignity and meaning--and where two people, separated by an impossible divide, can begin to see each other as human. But when a man is killed and a bounty is placed on Wash's head, Christopher and Wash must abandon everything. What follows is their flight along the eastern coast of America, and, finally, to a remote outpost in the Arctic. What brings Christopher and Wash together will tear them apart, propelling Wash even further across the globe in search of his true self. 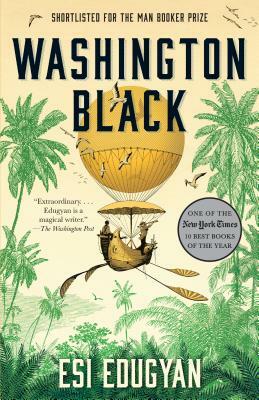 From the blistering cane fields of the Caribbean to the frozen Far North, from the earliest aquariums of London to the eerie deserts of Morocco, Washington Black tells a story of self-invention and betrayal, of love and redemption, of a world destroyed and made whole again, and asks the question, What is true freedom? ESI EDUGYAN is the author of the novels The Second Life of Samuel Tyne and Half-Blood Blues, which won the Scotiabank Giller Prize, and was a finalist for the Man Booker Prize, the Governor General's Literary Award, the Rogers Writers' Trust Fiction Prize, and the Orange Prize. She lives in Victoria, British Columbia.